We are always thrilled to host artist demonstrations at the Copley Society of Art. Learning about our artist members’ processes is always captivating and insightful. This past Saturday Co|So held a demonstration during which Janet Schwartz and David Kaphammer shared their different approaches to working in the pastel medium. Janet revealed to the audience that to begin her work she not only takes an image of what she will paint, she also creates a small-scale version of what the final artwork will look like. In doing this, Janet can insure that all of her values will be accurate. As a practicing artist and art workshop instructor, Janet immerses herself in the arts, either working, teaching or attending workshops. Despite her need to explore diverse themes, Janet is consistently drawn to bold images and dramatic light. Through her demonstration, Janet Schwartz primarily focused on the importance of value and composition in painting. Just as seen in her pastel painting, Marina, her work often depicts her strong interest in painting rainy, realistic, and impressionistic subjects. She is particularly drawn to the chaos and unexpected beauty of urban and nocturnal landscapes. With her recent relocation to North Shore she has found a renewed interest in painting boats and other nautical subjects. David Kaphammer began his demonstration with a preliminary drawing of a tractor. Often, farmers can recognize the exact model he portrays in his paintings of the agricultural equipment. He has been drawing all of his life and was first inspired by Dr. Seuss books. David often finds himself painting local landscapes, tractors, trees, and blue shadows on freshly fallen snow as seen in his pastel painting, “Winter Light,” pictured below. David also finds inspiration in warm low afternoon sunlight. He says that this time of day creates drama and magic, gives form, and infuses a scene with emotion. 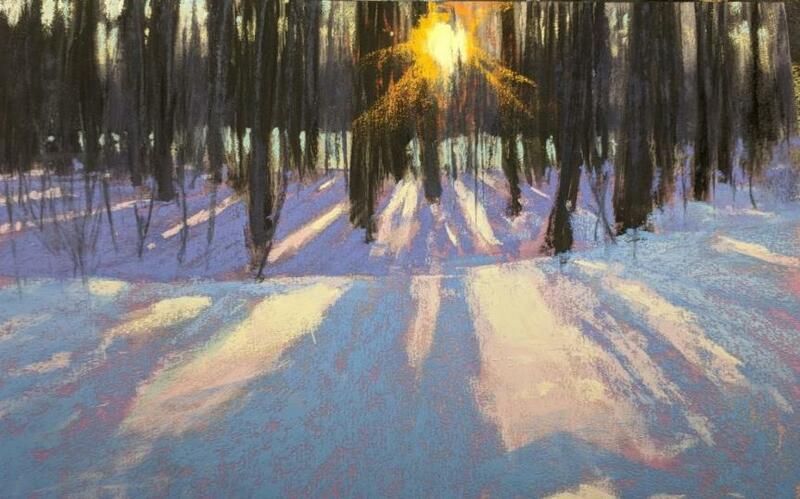 During his pastel demonstration, David emphasized the importance of light as well as attention to shadows. Pictured on the left: Dave Kaphammer’s final piece. Pictured on the right: Janet Schwartz’s final piece. You can currently see works by both artists in our Holiday Small Works show, open through December 23rd. Co|So hopes to see you for our next artist demonstration!